King Edward VII College of Medicine, Singapore (1905)University of Malaya, the first University of the country, is situated on a 750-acre (309-hectare) campus in the southwest of Kuala Lumpur, the capital city of Malaysia. 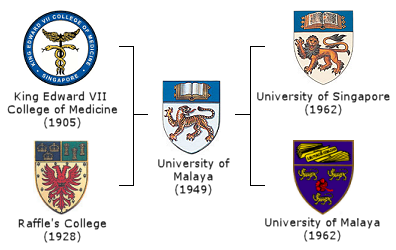 The University of Malaya grew out of a tradition of service to the society. Its predecessors, the King Edward VII College of Medicine established in 1905 and Raffles College in 1929, has been established to meet urgent demands, one in medicine and the other in education. Raffles College(1929)When the two came together to form the University of Malaya in October 1949, this was so that they might perform together an even greater service - to help lay the foundations of a new nation by producing a generation of skilled and educated men. Hence the University of Malaya was established on 8 October 1949 as a national institution to serve the higher education needs of the Federation of Malaya and Singapore. The Engineering Society of University Malaya which is formally known as Persatuan Kejurutearaan Universiti Malaya PKUM is one of the oldest society in University of Malaya. Established in 1958, PKUM has over the years proved to be the one of the most reputable and recognized society both inside and outside the varsity. To cultivate interest in various fields of engineering while fostering cooperation and friendship among the members and staff of the faculty. Ultimately, the society strives to enhance leadership qualities, professionalism and other important attributes relevant to the development of an individual.